Loud and proud was the order of the day at Wigan for Crawley’s first round FA Cup tie last Saturday. Both players and fans responded brilliantly with a fantastic effort both on and off the pitch. It was a case of what might of been for Harry Kewell’s battlers after Jordan Roberts had fired in a contender for goal of the season to put the Reds one up against the 2013 FA Cup winners. Further chances were squandered by Crawley on an afternoon where we just lacked that quality in the final third. But a 2-1 defeat was by no means a scoreline to be worried about. 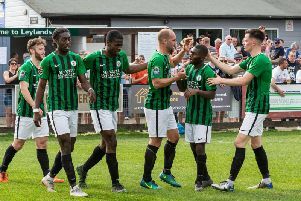 Everyone of those players can hold their heads up high and take those efforts into this weekend’s huge home game with fellow early season strugglers Forest Green Rovers. It’s a game quite simply that Crawley have to turn up for and win. Home form has been absolutely atrocious this season and if you don’t win your home games then you find yourself right down there, just as West Ham United are finding to their cost in the Premier League this season. The difference between ourselves and a Premier League team is that the Hammers can go out and splash the cash in January. Whereas a League Two outfit like Crawley has to borrow and beg for players around the lower leagues just to find that bit of quality that could make the difference come May. One real positive from the last week has been the return of our main summer signing, Dutch striker Thomas Verheydt who has been out injured for the past eight weeks. Thomas played for 60 minutes in our 3-1 home win against Bognor in the Sussex Cup last week and also got 15 minutes in the FA Cup at Wigan on Saturday. A presence is the one thing we have lacked all season and that’s something Verheydt will certainly give us. But let’s not forget all players take time to adapt to our fast-paced English game. Thomas will be no different, let’s all give the guy a chance to settle and then I’m sure we will reap the benefits with some much-needed goals; something which has been a real problem to come by for Harry Kewell’s side so far this season. Pictured below, a case of what might of been. The scoreboard after 20 minutes the DW Stadium after Jordan Roberts had put us 1-0 up in the FA Cup. (Photo by Reds fan Keith Miller, from Burgess Hill).